This entry was posted in Comments about Cycling on November 14, 2013 by Steve Tilford. I was reading an article that said Chris Froome, current Tour de France champion, said that he wants to hear what Lance has to say about Lance’s history. Chris says it would “put the story to bed”. I started thinking about it again and decided that if the price that “we” have to pay to hear the complete, unedited, story of the history of Lance and his cronies, is that his ban is suspended and he can compete again, then I think that it is a fair deal. Letting one guy compete to get the knowledge he holds seems like a very good trade. I’m not for “putting the story to bed”. I think it will show the magnitude of the past and current problems we face, thus help speed up the process of ridding the sport of the problem. I know this sounds like a complete turnaround of what most would think that I would say. But I think the knowledge, and getting the knowledge in a timely manner, like now, is important enough to make an exception to my normal, harsh, personal opinion. If Travis Tygart thinks Floyd helped him learn about the procedures the cyclist use to dope, then Lance would be a score. Lance is a pretty smart guy. At least smart enough to shed an enormous amount of light on the current practices of doping in cycling. I wonder if we would ever hear the whole truth if this happened? 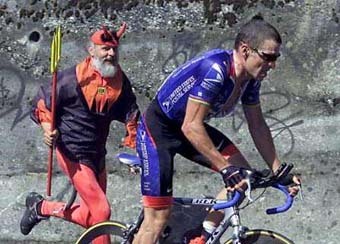 If Lance did this real soon, we wouldn’t have suffer through the upcoming Johan Bruyneel hearing. That would be a big plus. It’s scheduled for next month, but I’m sure it will put off again. Lance would have to come completely clean. Name names, contacts, processes, everything. He answers all questions. Lance doesn’t seem like the type that would completely turn over and do this, so I think this all is just a pie-in-the-sky idea. But, if Lance really wants to compete as badly as it seems he does, then maybe it would work. I think they should make him the offer and see how it plays out. ok who hacked into your account? Lance had his chance to come clean, Multiple chances actually, and all he did was regurgitate more lies. Everything Lance does is self serving and not for the betterment of cycling. If he really cared about disclosure and helping the sport he so ruefully conned for years, he’d fly to Colorado without his lawyers and spill his guts to Tygart with no deal. Anything less than that, I daresay, would be just another attempt by Lance to control the situation. Keep on keeping on Steve!! I think UCI has too much to lose if Lance is allowed to come clean. Honestly, he would shed a dark light on a the perils that cycling still faces. If he is the ‘King Pin’ that he is made out to be, he would open up a whole bucket to worms – skip the can! He might be able to single handedly take down the governing body of a sport for being corrupt and he might destroy the images of some of the historical figures still seen as heroes of the sport. If he is given he opportunity to come clean and not much is exposed – if he is just another doper than it makes the UCI and WADA look bad for making him the scape goat in the entire doping era. Can you imagine how that would make everyone look who pursued him tooth and nail to “Rid the sport of the most sophisticated doping program the sport has ever seen”? Eff Lance. What’s the lying, bullying jerk-off gonna tell USADA or the UCI that they don’t pretty much know already? As the posters above said, he had his chances. Anybody who feels sorry for this jackass needs to turn on CNN for five minutes and get a reality check. Can’t trust Lance for anything, every word he speaks has only one aim, to serve himself. It be more worth your while to pursue where Hoffa’s body is. Who wrote this? What have you done with Steve? LOL, just kidding. No, i agree with what you’re saying. Far more good would come of that deal than any benefit from a lifetime ban (the benefit presumably being as a deterrent to others). The toughest part for many in the cycling community would be getting past their own desire for vengeance (“send him to jail” !!!) which (IMO) has already trumped doing what is best for the current and future generations of riders, the vast majority of whom I’m believing are clean. It sure would be interesting to see the responses if Lance were to show up say at a local marathon. lance is a liar. Even if he tells us he’s coming clean, he won’t tell us the truth. Only started doping in 94. The linebacker and his big thick neck (and maybe some already mutating cells in his testes, oh the irony) who won the world’s with Carmichael’s help was totally clean. Fk you Lance. Who cares if lance competes? He is past his prime anyway. Anybody who competes against him cant count his results. He’s done. BALCO- Victor Conte? Told how to cycle and beat the system years ago. Not cycling, so what? I am so sick and tired of listening to this. If put in the exact same situation, most of you would have done exactly what Lance did. When attacked by the same people, that allowed the situation to escalate, that allowed the doping to continue unabated. By a guy (Tygart) who hated him, and whose only goal was to destroy him. And people that he turned from nobody’s, into household names. He fought back venomously. And most of you would have done the exact same thing. Lance wasn’t the king pin of anything. He was just another one of the doping, cheating athletes, who were so prevalent at the time. We have politicians in Washington, who do worse things than Lance, every day of their lives. Get a clue people, and drop the holier than thou attitudes. Half of you have probably never seen the inside of a church. My only complaint is the disparity of punishments. Others did this before him, and many others were caught after him. How may got lifetime bans? I may of course be wrong, but I think the answer is ZERO. We also need to realize that as long as there are performance sports, the athletes that perform them are probably going to want any edge that will allow them to outperform their competition. This has been true for decades and will likely continue to be true. Every time somebody comes up with a way to expose the use of PEDs, somebody else comes up with a way to better mask it and/or a new drug not yet tested for or that can be detected. How about this: MAKE all of them take PEDs. Make it mandatory. They the playing field would be leveled. Of course that idea is ludicrous, but I so wish it doable. If put in the exact same situation, most of you would have done exactly what Lance did. Uhhh. No. Some did, but many didn’t. One good example is Edwig Van Hooydonck. By a guy (Tygart) who hated him, and whose only goal was to destroy him. I think someone is making allegations they can’t prove and don’t want to disprove. I think you mean Thom Wiesel and Pat and Hein at the UCI fought back. Well, there was Armstrong trying to get USADA de-funded too.. So, maybe you are right. But the guy was given the opportunity to tell all and certainly did exactly the opposite. Lance wasn’t the king pin of anything. Thom Wiesel? Steve Johnson? Knaggs? Pat McQuaid? Hein Verbruggen? He was just another one of the doping, cheating athletes, who were so prevalent at the time. If you aren’t going to enforce the rules, then I’m World Champion. So, whatever your moral outrage about Washington is, the same rules apply. There are no rules for favored people. Even then, he’s still a so manipulative and still seems to be protecting Wiesel, Carmichael, and the rest of the team that I don’t see how USADA would get anything useful. Personally, I would like to hear Froome’s story. Neat trick to go from a nobody whose own mother asked whether he had any talent as a bike racer after watching him get shelled from a amateur race to besting the record times of dopers on GT climbs. He can compete now. No high-profile marathons, no USAC bike racing, no USAT triathlon. All of those are mostly sanctioned by WADA affiliated sport federations. Still plenty of events for him to attend if any promoter will have him. Except the point is to get paid appearance money. He can be Austin’s bikepathelete of the year. Not sure what he’s waiting for. Oh, that’s right, appearance fees. How many cooperated that got the 6 months ban? All of them. The best way for “us” fan’s riders and pro’s alike to move on and foward is to never speak his name again, never forget mind you but let him ride out his days (pun intended) in Austin, Aspen or where ever as a persona non grata into the shadows with just him his thoughts and his massive ego with the spotlight never to shine on him again. oh yea and he can hang thouse Yellow jerserys back up cuz you won the TDF fair and square buddy. rant over now I am gonna ride around the block with my kiddo…. Not sure Greg would like that though. +1 BigTex is not smart. Cunning and clever? Certainly, but he’s still operating on the grade-school “But Mom, the others did it too” mentality. Perhaps they should call his bluff (again) and let him participate..but he goes first to confess and as soon as he dodges a question with some BS answer – he’s kicked out. Game Over. Only after he answers EVERY question, the authorities are satisfied and all his information is verified, does he get ANY consideration about his current status as banned for life…and maybe that should hinge on every single one of the people he screwed over agreeing to reduce his ban? That might give him real incentive to apologize and write out some hefty checks to make things right. That’s the best thing i’ve heard yet. Greg would see the funny irony in that just fine. Unfortunately its way more likely that we’d see LeMond bikes at the Pro-Tour level than Lance ever getting back there. Lance will just take a page out of Levi’s race book: Jump in local mtb races and pull out right before the finish line. Is there really anything left that Lance could say that would be of any value? All he could do is say that Floyd was right, Tyler was right, Betsy was right, etc. He could rat out “Rider 15” but unlikely. He could turn on Johan and say he was the mastermind of all the teams doping. Even more unlikely. He could call out Carmichael for doping juniors ( http://bikezilla.blogspot.com/2011/05/chris-carmichael-ignored-lance.html). So unlikely……. Give back the careers of all the people he ruined. That’s impossible so all he can do there is say he’s sorry and that’s worthless. The sport can fix itself without his “cooperation” to get a reduced ban. Roberto, apart from the suggestion that genuinely honest people go to church, i agree with you, and this is the reason my criticisms are not as harsh as that of most other peoples’. Look at NFL, close to 100% on steroids. Each player takes more PED than an entire cycling team. Plus, unlike in cycling, there are high school kids following their lead and doing the same. But consider the player, often not from the greatest side of town, who sees an opportunity to be the first to go to college not just from his family, but from his entire neighborhood. Then he’s told he can become a pro and in 2 years earn enough money to transform the lives of his entire family. But he’s going to have to do what everyone else is doing or forget it, back to the ghetto. What would you do? NFL’s problem is a whole order of magnitude bigger than cycling’s, but I struggle to criticize someone when, given his circumstances, I’d likely do the same. In fact, i’d go even farther. I’d give him back three of his Tour Victories………Just to shut LeMond up. There are scores of Doctors and money men who should get their pockets emptied. PS On second thought, let him compete in everything except Masters bike races. 3. He – and all the other Cat “D” riders – can only be sponsored by drug companies, makers of EPO (and they have to actually *use* the EPO made by their sponsor), and dealers in drugs. Once a rider enters Cat “D”, that’s where he or she stays, for life. The only way to get suspended from racing is to compete against any other non-Cat “D” rider in any sort of event, and then the suspension is for life, on the first offense. On the subject of doping, any opinion on Ballan, Steve? Or is BMC off limits? He could start with donating ALL his reamining assets to charity and/or the foundation. Then he could start using public transportation for getting around, or just ride his bike like ordinary ppl. Only after doing this would it be interesting to hear what he has to say. But on the other hand the best thing with Lance being allowed to race again would be if Steve could lap him in every race he (Lance) ever would take part in from now on and till the end of times. That would be something to look forward to! noberto, awsome post.. dosent steves gal friend work for BMC? steve will never bring up all those guys on drugs.. WHY NOT STEVE?? if all your posting latley is about drugs in cycling, start at BMC …clean that up..you know as well as all your blog readers that that program like all the others are on drugs … your blog is so “talking out of both sides of your mouth”…leep it up!!.. lol!! lets clean up cycling…. but i aint asking my gal friend about her team..hahahah!! Hey Mike, if your spelling doesn’t improve, they’re not going to let you pass 3rd grade. Just saying. Steve, where’s the outrage over Ballan and BMC? Cat got your tongue? Oh wait….. Your wife works for BMC. Knowing would make me a Lance fan. I’m sure he still laughs and wants to grab us all by the ears and say “If you only know what’s really going on.” Like the NFL, pure rot from the ground up. We think it, but still try to deny.